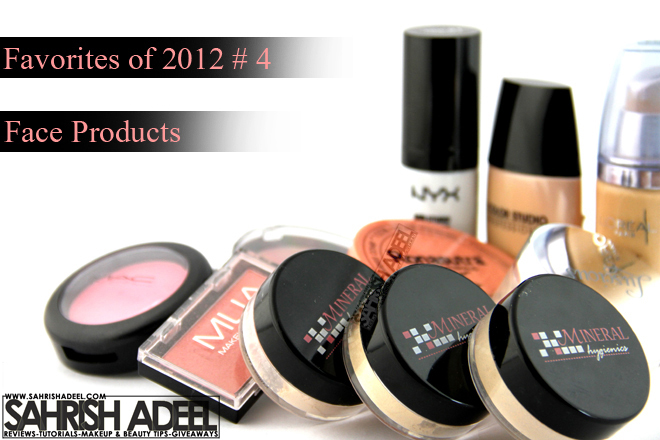 Face Products - Favorite of 2012 # 4 | Sahrish Adeel - Malaysia based Pakistani Beauty & Lifestyle Blogger! For me the most important products in makeup routine are face products, especially the primer, concealer & foundation. Reason? They get into direct contact with the skin and the quality of the product can effect the skin majorly in a good or bad way. Let's see what are my picks for the year 2012. NYX's HD Photogenic Primer (review here) has worked really nice to give me a smooth base for my foundation reducing the bumps and flaws as much as possible. My makeup lasts longer even with oily T-zone and hot weather of Malaysia. L'Oreal's White Perfect Pearl Foundation (review here) was the best match for my skin tone I ever found before trying Color Studio Pro's foundation. It works in the same way as CSP's but sadly I cannot find it anymore. The bottle you see in the picture is expired but I just cannot throw it away neither can I use it. I bought L'Oreal's True Match foundation as well, shade was fine for my skin tone but the rest of the formula was a disaster. GloMinerals' Camouflage Oil Free Concealer (review here) is so far the best concealer I have ever used. Even though it is a cream product, it works fine for my skin. Mineral Hygienics' Powder Foundation (review here) has been my favorite this year for giving me light to full coverage while staying in place even with sweating. Great powder foundation that does not get cake-y. Ronasutra's 2 in 1 Foundation & Powder (review here) is such a light weight, silk textured product. I mostly use it when I am in absolute hurry and I just want an ultra matte skin for hours with a bit of coverage. As a foundation, it is only good for light to medium coverage but layering it on top of a liquid foundation gives really fine result without going cake-y. Love it. Mineral Hygienics' Finishing Powder (review here) is a dream come true for anyone who have combination to oily skin. This baby keeps the skin matte for longer hours and does not let your makeup slide. I am literally on my last uses and I am so going to get a new jar. This is my most used powder product of this year for sure. Color Studio Pro's Blush in Havanna (review here) is an ultimate gorgeous shade and I think a blusher pot cannot go any bigger than this one. MAC's Sheer Tone Blush in Pink Swoon (review here) is my favorite shade when I want a really natural blush-ness on my cheeks. Like the one you get after a heavy physical activity which makes you look healthy & young. 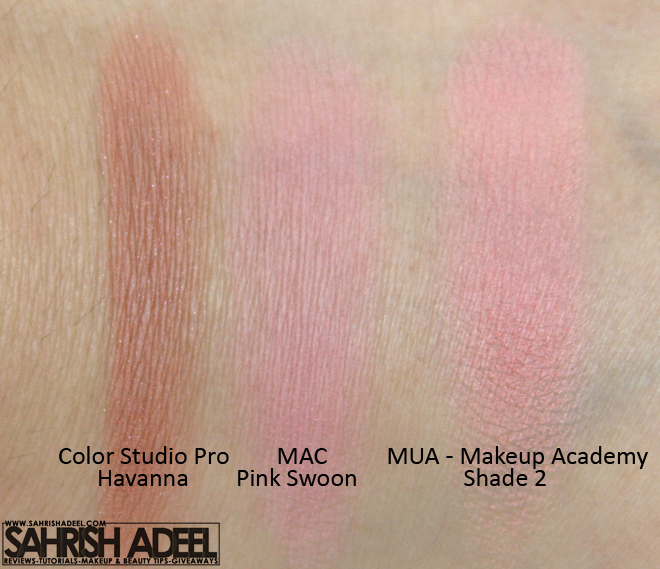 MUA Makeup Academy's Blush in Shade 2 (review here) is so far the best and super budget friendly blusher I have ever tried. It has all the qualities you can find in an expensive blusher. I personally would go for the whole shade range of blushers by MUA than buying a single blusher from a high end brand. Luscious Cosmetics' Sparkling Face Shimmer in Star Light (review here) is so far my favorite moderate highlighter that gives perfect party finish to the face without looking odd. Mineral Hygienics' Highlighter in Glow (review coming soon) is my top favorite highlighter that is perfect for everyday makeup. It is extremely fine and light powder. I hope you have enjoyed this post. Do check rest of the posts in this series here and stay tuned for a few more posts in coming days.